Radar Detector in California Legal? Radar Detector Laws MN What Are They? We all know that an unattended trailer makes an inviting target for the random burglar. It is an easy hit any thief. In fact, one that doesn’t even require any form of prior planning to execute. Keep in mind that while a majority of stolen vehicles are recovered, 80% of stolen trailers disappear for good. The loss of a trailer and the contents stored inside is not only expensive but quite inconveniencing too. This is why it is important to secure your trailer and its contents with the best trailer lock available. 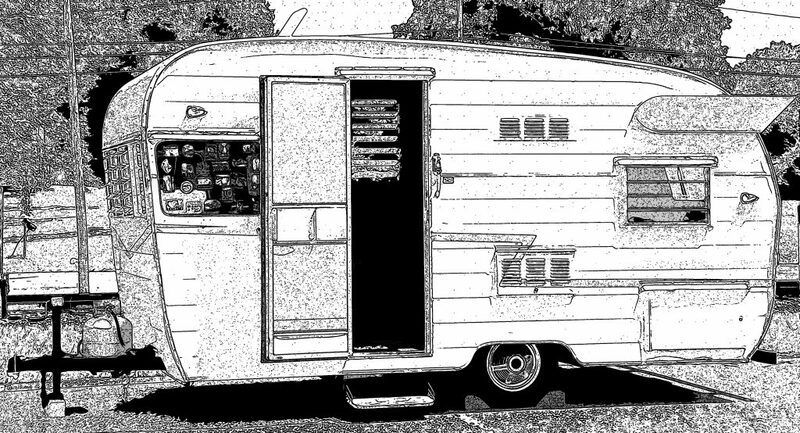 The trailer, by itself, is one of your most valuable possessions. If it contains precious cargo such as toys, bikes, and jet skis, any loss due to theft can be quite significant. The best thing would be to keep an eye on the trailer at all times but we all know that’s not practically possible. The most practical way of securing your precious trailer and cargo is by using the best trailer lock security system. The problem, however, is how to find the best trailer locking device given the huge number of trailer hitch security options on the market today. You actually need the best trailer lock money can buy to give you reliable protection against burglary and theft. In this trailer hitch lock reviews article, we look at some of the best options available on the market today and some of the most important factors you need to consider when shopping for the best trailer security devices. Here’s our shortlist of the 10 best trailer locks on the market today based on our research, tests, and trailer coupler reviews by people who’ve actually used the products. Made by Trimax, a reputable trailer lock brand, the UMAX100 is a great choice for trailer owners who want to secure their precious possessions with a universal lock system that fits into multiple couplers. The UMAX100 fits perfectly into a 17/8-inch or 2 to 5/16-inch coupler perfectly. It is a great option for those who have no idea about the same size of their trailer hitch couplers. According to most trailer coupler lock reviews, the UMAX100 has an impressive heavy-duty design and size. It is made of steel with a sleek black nylon cover. Its imposing hardened look is enough deterrence to any opportunistic thief. The lock’s ballistic nylon cover makes it very easy to handle in cold weather. The cover provides additional protection layer while keeping away dirt, grime, and moisture from the lock’s internal mechanisms. It is made with durability in mind. Thieves will also find it difficult to crack the lock with brute force. Its ballistic nylon covering will soften hammer blows a thief may try to break the lock with. If you are looking for the best coupler lock that fits a wide range of trailer hitch couplings, the UMAX100 from Trimax is a good choice. It is also a perfect option for those who have multiple trailers with differently sized couplers. It has an imposing look that works as a deterrence to thieves. This is one of the best utility trailer locks for RVs, vehicles, and trailers. One of its key features is a push-lock mechanism that makes it extremely easy to open the lock. It is one of the easiest-to-use utility trailer locking devices on the market today. It is also strong and intimidating enough to give you added security and theft deterrence. Its locking hitch pin can fit into ½-inch and 5/8-inch receivers. The hitch locking pin has a rating of up to 3,500 pounds. The lock’s head can rotate 360 degrees and its snap-on cover is not only weather resistant but also provides sufficient protection to the internal mechanisms against dirt and grime. It has an extremely durable design and will serve you for long. Its cup is completely watertight to ensure the lock is always protected from moisture and dust. Thieves will find it hard to pick the lock thanks to its four-pin cylinder system mechanism. It comes with two trailer receivers and keys. It has a pocket-friendly price tag too. It is weather resistant and provides additional protection to internal mechanisms from dirt, grime, and moisture. How would you love to have a trailer lock with double locks that can be conveniently opened using a single key? This is exactly what you get from the Trimax THP2XL trailer door lock. Let’s start with some of the key features of this trailer door lock system. The lock comes with bolt cutter protection. It is strong enough to withstand bolt cutter attempts by thieves and burglars. It also features an enlarged opening that makes locking and covering almost every size of trailer hasp. The lock has a thick body that makes it even stronger. It is a super tough lock that will deter any opportunistic thief prowling in your compound. The two packs of this lock are keyed alike. You can use the same key to open both locks. It is also lightweight at just 4.5 pounds. It is a compact lock that easily fits into any type of trailer. 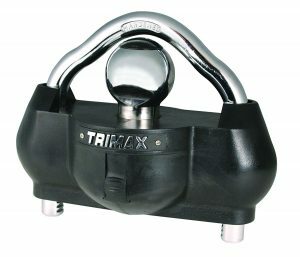 If you are looking for a versatile, durably constructed lock the Trimax THP2XL is a perfect choice. Since its inception way back in 1921, Master Lock has become a household name in the locking system industry. The Coupler Lock 389DAT lives up to Master Lock’s great workmanship and reputation. The lock may not boast of impressive looks but compensates for looks with solid construction and strength. It has a metal build and a thick paint on the upper part. The manufacturer probably made it to stick out prominently when attached to your trailer coupling to provide visible deterrence to burglars. As a universal lock, it can be used on different trailer couplings. The versatile lock is a good option for those with multiple trailers. It gives you a snug secure fit on couplings of different sizes. You won’t need to buy a different lock for each of your trailers when you have this universal lock. You also get the lock with two sets of keys just in case you lose one. The lock has a good deterrence factor but can be broken with a sledgehammer. However, not many trailer locks can withstand 5 minutes of serious battering. If truth be told, trailer locks serve to deter thieves or make their burglary attempts more difficult to succeed. Another notable downside of this lock is its size. However, it serves well as a less expensive deterrent lock for trailers with other coupling sizes. One of the most common problems with universal locks is failure to provide a snug fit on differently sized hitches and couplers. The Tow Ready lock solves this problem by ensuring a perfect fit on any 2-inch coupler. The lock also works well with most 2 to 5/16-inch couplers too. It is a sturdy and quite capable lock with better performance than a majority of universal locks on the market today. Your residential hoodlums will have a really difficult time pilfering away your trailer when you have this lock in place. True to its name, the lock does indeed have a Gorilla-strong overall build quality. It comes in an impressive but intimidating all-black finish and an all-metal robust construction. Even the most dedicated burglars will think twice when they come across a trailer secured with this lock. It is even harder to pick. Its keyhole faces downward below the lock which makes lock-picking it a tedious task even for professional thieves. The lock also comes with two keys just in case you misplace one set. The main downside with this lock is the downward-facing key position. Just as it makes it extremely hard for someone to pick the lock so will it be difficult for you to insert the key and open the lock. You have to do some fidgeting with the lock mechanism to free up your trailer, especially when you are in a hurry. Despite the key position flaw, the Gorilla Guard is indeed a strong durably constructed 2-inch lock that does a satisfactory job. The Brahma Trailer Wheel Lock is the best anti-theft lock you can buy to secure your trailer. It allows you to have peace of mind knowing that your trailer is safe wherever you’ve left it. At a rating of 30 pounds, it is the heaviest duty wheel lock you can find on the market today. What makes this lock quite efficient is the fact that it securely locks your trailer’s wheel, effectively preventing any rotation or movement or even the tire from being removed. Any thief who sees a Brahma Wheel Lock on your trailer will scurry off to find another easier target. The bullish lock provides you with maximum trailer security. The sturdy wheel lock is also well designed. It is quite heavy too but fortunately it lies flat while in storage. Another great thing about the Brahma Wheel lock is its numbered and copy-protected keys. You get four keys when you purchase the lock but the company keeps two more keys for you just in case you lose your set. The keys are extremely hard if not impossible to duplicate. One trailer wheel lock review cites the Brahma lock as the most intelligently designed wheel lock today. This is because the lock has a mechanism that controls its folding arms to prevent the arms from being moved or detached from the body when the lock is in place. Its internal lock faces downward to make it extremely hard for thieves to pick the lock. The downward facing lock also helps to keep rainwater, winter slush, or corrosive chemicals in melting ice from entering and damaging the lock’s internal mechanism. The manufacturer recommends storing the lock in locked position to make it last longer. The Brahma is a beast lock that stays put even when the thief deflates your trailer’s tire. Cutting the lock with a hacksaw is out of question as it would take a long time and create a good amount of noise, which is the last thing a thief wants. The lock also provides a perfect fit thanks to its fully adjustable steel rim cover which can be adjusted to 8 different settings. It may take time to learn how to install and remove the lock but after you’ve done it a few times, the whole process becomes quite easy. The lock has simple maintenance requirements. You just need to lubricate its moving parts regularly with oil, preferably SAE 30 oil, to keep things operating smoothly. Given its strength, durability, and performance, the lock has a reasonable price tag too. Photos in the assembly manual are not very clear but you can see clear color pictures on the company’s website. This is a dual function trailer lock that locks both the back of your trailer and the wheel at the same time. Talk of versatile security in this amazing trailer lock! It has J-style support which makes it easy to use and quite efficient. The J-shaped lock provides a strong and solid backup that thieves will find extremely hard to break. The Brinks 3020-057 is also bolt cutter protected. It is a solid lock that will withstand cutting attempts even when thieves attempt to cut through it with a bolt cutter. Cutting attempts are not only futile but will also create a lot of noise. Any thief would rather walk away than risk tempering with this lock. The lock is made of extremely strong materials but is light and compact too. It weighs just 1 pound and measures 1.5x6x15.5 inches. You won’t have to carry around a bulky locking system for your trailer. The versatile lock is designed for trailer owners who want maximum protection for their precious possessions. The Reese Towpower is a universal lock that can be used to secure multiple facilities and trailers with differently sized coupling devices. It is compatible with multiple locks hence its universal reputation. It is has a strong but lightweight aluminum body. Aluminum is a light but strong metal that’s also extremely resistant to elements. It also withstands wear and tear attempts impressively. The overall construction of the Reese Towpower universal lock was done with strength and durability in mind. It also comes with a heavy-duty steel locking bar that your regular trailer thief would find difficult to cut or temper with. We all know how strong, tough, and durable steel is. The heavy-duty steel lock bar makes this lock one of the safest and resilient security options against common trailer burglaries and break-ins. The lock uses an intuitive ratchet design for added strength and resilience. It is constructed in the shape of a ratchet with eleven locking positions. You can use it on a wide range of facilities besides your trailer. It fits snugly on 1-7/8-inch, 2-inch, and 2 to 21/6-inch couplers. If you are looking for a versatile, convenient, and heavy-duty stainless steel lightweight lock to secure multiple facilities, get this Reese Towpower universal lock. It is durable and quite easy to use too. Some users claim it’s a bit thin and may encourage thieves to attempt cutting through it. However, the steel arm, despite its rather thin appearance is strong enough to withstand cutting attempts. If you are looking for the best travel trailer hitch lock, then this universal hitch lock from the renowned Tough Auto brand is a good choice. Traveling with your trailer exposes you to unknown threats away from home. You’ll actually need an effective deterrence against thieves seeking opportunities. A versatile hitch lock will be of great help when you want to keep thieves off your precious trailer while traveling. The Tough Auto lock is basically a trailer hitch ball locking system with a decent but intimidating design. It has a sleek look too without the usual rough edges associated with other locks. However, don’t be misled by its smooth well-defined finish to underrate its sturdiness. It is a solid well-built lock with a weather and element-resistant paint job. It is also available in an assortment of vibrant colors. To withstand the ravages of rain, snow, and sun, the lock is made of quality aluminum alloys to give your trailer a high level of protection. It is easy to lock and open and basically functions extremely smooth. The ball system also fits easily on your trailer’s coupling. Overall the Tough Auto lock may not measure up in sturdiness with other higher priced locks but t does a good deterrence job. It is also lightweight not only in weight but on your pocket too. It is a reliable trailer hitch ball lock that not only affordable but provides value for money as well. Your RV is a long-term storage facility that requires tough, weather resistant, and a secure locking system. The RV stays outdoors throughout its life and is always exposed to human and climatic threats that can adversely affect its lock. You, therefore, need a lock that has stood the test of time, thieves, and elements. That’s exactly what you get in the Amplock U-BRP2516. It is a sturdy RV trailer lock designed for strength and durability. This Amplock coupler lock has a high-quality construction that uses a perfect blend of ducted cast iron 65000, heat-treated steel, and stainless steel materials. With such high-quality materials, you can expect the best performance, strength, and reliability from the lock. For additional security, each Amplock comes with its unique key. You cannot use another key to open the lock even if the key is for another lock from the same brand. The unique key system ensures maximum security to your valuable RV trailer and its contents. Another great feature of this Amplock lock is its control and identification system. This protects your RV from unauthorized access with a unique key identification system. Every user is scanned and vetted before they can open the lock. If you are looking for the highest level of trailer locking system, then you may need to check the Amplock U-BRP2516 RV Trailer lock. It can be customized to suit different doors and lock mechanisms. What do you need to know before you go out to buy the best lock for trailer hitch security? For a start you need to know the important needs you intend to solve with this useful utility. It is also essential to know what type of coupling system your trailer uses, whether you park it under a shaded or open area, and your budget for this specific item. To begin with, let’s look at a few reasons why you need a secure trailer lock. Why Buy the Best Utility Trailer Security Locks? It is quite obvious that if your trailer does not have a secure tow hitch lock, it is vulnerable and open to threats from opportunistic thieves. Anyone with a devious mind can easily drive away with your trailer and its contents. You don’t need to make it easy for thieves to scurry away with your possessions after you’ve spent thousands of dollars on the trailer or its contents. You need to install a solid lock on the trailers couplers that would give the thief a difficult time to rip it off. The delay and noise caused by a hard to steal trailer will raise alarm and prevent the theft from succeeding. Most likely the thief will abort his or her devious mission and take off leaving your trailer intact. Get a peace of mind in the knowledge that your trailer is secure whether you are at home or not. Besides making it difficult for thieves to steal your trailer, a good trailer hitch lock will also serve as deterrence to theft attempts. If truth be told, all locks can be disabled when the thief has enough time, opportunity, and tools. The strong hard-to-break hitch lock will not only take more time to break but will also increase chances of the theft’s discovery. Most thieves would rather walk away to look for another target than risk being discovered or caught. A hard to crack lock provides this form of deterrence by discouraging the thief from tempering with your trailer. Utility trailer security locks provide different levels of protection based on their price, features, and build quality. A cheap trailer hitch lock will obviously have a flimsy look that can be shattered or picked with just a few attempts. It can be inviting to a potential trailer thief. A sturdy trailer hitch lock, on the other hand, has a more complicated design and is made of high-grade, heavy-duty steel materials. It can even withstand noisy cutting attempts for several minutes, which is the last thing a thief wants. Most thieves will simply walk away from an imposing hardened trailer hitch lock than risk cutting or prying efforts. Remember the longer it takes an intruder to cut or break the lock, the more secure the lock is. There are mainly two basic designs of hitch locks, namely the universal lock and the hitch pin lock. According to a majority of trailer lock reviews, the universal lock is very popular with most trailer owners because it fits into a wide range of couplers with varying sizes. The lock has a metal ball as well as a bridge that locks the device firmly in place. The best trailer tongue lock can fit in couplers with sizes ranging from 1-7/8 inches to 2 inches and 2-5/16 inches. This type of hitch lock is useful for those with multiple trailers. The deadbolt fits into holes inside the couplers. You’ll need to know the exact size of your hitch coupler before you buy this type of lock. The advantage with these deadbolt locks is that they provide a tighter fit than most universal locks. Pin locks are also great for RV camping. Another increasingly popular type of hitch lock is the Krok Lock. This one is made of hard plastic and easily fits on your trailer hitch. It is usually bolted to the hitch. Thief will not be able to unbolt it from the hitch while it’s still locked. The krok lock trailer lock system is fast and easy to install. You just need to drill two holes and bolt the entire assembly on to the hitch. To serve their purpose, trailer hitch locks come with locking mechanisms. The level of protection provided by the lock depends on the brand or manufacturer. Most leading brands however sell hitch locks with reliable locking mechanisms that are not easy to pick. Remember if your device’s locking mechanism fails or can easily be cracked with a few prying attempts, it won’t serve the purpose you bought it for. The locking mechanism should also be protected from the elements. Some locks even feature a protective cover over the keyhole to prevent water, snow, or melting ice from seeping inside the lock mechanism. There are other hitch locks designed to work with external padlocks and disc locks. These provide you with the convenience of buying a relatively cheap lock then securing it with your own high-quality lock and key protection device. A strong unbreakable padlock enhances the security of such a lock. Just make sure it is made of strong, heavy-duty steel that can withstand simple cutting attempts. So how do you choose the best hitch lock for your trailer? Here are a few factors to help you make the best purchase decision when shopping for the best coupler lock. You obviously want to invest in a trailer hitch lock that will serve you for years to come. The durability o the lock is therefore an important factor to consider. If the lock is not made with solid and strong materials, it is not only insecure but won’t last long too. It can easily be broken. Choose a lock that is solidly built and durable. Check the materials it is made from. Good examples of durable materials include stainless steel and heavy-duty aluminum. The locking mechanism is another important factor to consider in utility trailer security locks. You don’t necessarily have to look for one with a complicated locking mechanism. A simple mechanism sometimes provides the best security. What you need to focus on is whether the lock is easily breakable or unlockable. If the lock cannot be easily broken or unlocked using picking methods or brute force then it will serve its function perfectly well. Is the Lock Difficult or Easy to Use? An easy to use lock will save you time, especially when you want to unhitch or hitch it in a hurry. Some locks have a complicated locking and unlocking process that could end up being a constant headache every time you want to use your trailer. Find an easy to use locking system but remember not to compromise performance with ease of use. You wouldn’t want one that thieves too will find easy to unlock without keys. The whole purpose of investing in the best trailer lock security system is to ensure that your trailer is secure when you are not around. It is therefore important to buy a lock with a strong body and locking mechanism. It should preferably have reliable protection from bolt cutters, hacksaws and other cutting tools. The lock should also be protected from rust and damage by elements so that it can continue protecting your trailer for a longer time. Invest in a lock that doesn’t suffer damages easily over a long time. One mistake most trailer owners make is to buy hitch locks that don’t fit properly to their trailers’ couplers. You can always go for a universal lock that fits different sizes of couplers but make sure that it actually provides a perfect snug fit. It pays to actually get the right measurement before you buy a lock to avoid either loose fitting or extremely tight-fitting hitch locks that may be difficult to use. A trailer hitch lock provides a reliable and efficient way to protect our trailer from theft attempts. The lock may not guarantee 100% protection, especially for trailers left in unguarded locations, but it will deter thieves or delay the theft process long enough for the theft to be discovered while in progress. For optimal protection, you should never rely on the trailer coupling lock alone. The best approach is to find the best fitting trailer hitch lock and supplement it with another lock to enhance its security. Adding more anti-theft or locking systems to your trailer will not only deter thieves but delay the theft too. For instance, you can enhance the lock’s security with extra heavy-duty chains locked with a strong padlock or use even more lock keys, especially for RVs. Such security measures will increase the time a thief would need to steal your trailer and create a more effective deterrence against theft. If you are looking for the best way to lock a trailer hitch, you could start your search with the products we have discussed above. They range from the best puck lock systems to highly recommended products in the trailer world industries. They are all tested products with positive trailer hitch lock reviews from actual users. Remember the security of your trailer starts with the measures you take to prevent the trailer theft from actually happening.